Design matters. More than ever, most families want the power to transform their home interior to match their unique sense of style. GE is tapping into buyers' desire to personalize their kitchens with the new style-driven brand, GE Café Series Appliances. With its signature Pro Style and Matte Finish, GE Café Series merges style and technology in the kitchen. "Before today, consumers did not have the chance to personalize their appliances and bring them into the overall design of the kitchen at an affordable price. Café marries luxury with affordability and encourages consumers to be bold in their choices, as the hardware can continually be updated to fit the latest trends and style preferences." Café offers the opportunity to continuously mix and match handles and knobs, allowing you to reflect the ever-evolving design and style trends and keep appliances as fashionable as the rest of the home. Café Appliances offers extensive choices in both modern colors and hardware attachments. It also features the latest developments in smart technologies, adding additional convenience and fun. When it comes to doing things your way, these models get it right: Café offers the style and features you crave. Get your hands on custom handles, French-doors, bottom freezers, ice makers, water dispensers, LED lighting, spacious interiors, and flexible storage options. Select fridges come with WiFi Connect and Keurig K-Cup brewing on the refrigerator door, so you can have your coffee to be ready when you are. These come with LCD touchscreens and are compatible with Amazon Alexa and Google Assistant. You're able to control Café Wi-Fi–connected refrigerators with the sound of your voice to do things like preheating water to precise temperatures and measurements while you relax in another part of the house. You no longer have to settle for stainless steel appliances if that doesn't fit the aesthetic of your kitchen. For style-driven consumers who love to entertain and keep their finger on the pulse of décor, the Matte Collection's premium finishes—in Matte White and Matte Black—are the answer. Matte White complements premium cabinetry and works well with bronze-toned fixtures, resulting in a layered space that feels connected, clean and timeless. With a luxe look and a smudge-resistant, soft-touch feel, this finish offers a fresh approach to a staple kitchen color. The Matte Black finish takes inspiration from the deep natural tones of wood and stone. Its depth and layered texture allow you to create a crisp, bold statement with room for additional details. Copper, a classic kitchen staple in both décor and high-end cookware, is the signature Café metal. Each handle in The Matte Collection carries a copper cuff with a discreet Café logo. Soft-brushed copper hardware is another custom option available for order. Here's a breakdown on what you can expect to pay for the latest Café products. If you're considering purchasing multiple machines, it is useful to keep in mind that Café runs seasonal promotions that encourage package purchases. These fridges beautifully combine form and functionality. Counter-depth design permits seamless integration into any kitchen while state of the art air filtration and humidity controls that will make your food last longer. With Amazon Alexa or Google Assistant enabled, you can heat water for coffee or tea with the sound of your voice. Additionally, get service notifications and 'door open' alarms sent straight to your mobile device. Love coffee and crave a cup as soon as you get up? With the Keurig Coffee Brewing system on the door, you can schedule your coffee to be ready as soon as you get out of bed. On these refrigerators, there is both a hot water dispenser and a standard ice/water dispenser. These features make it simple to have hot water, cold water, and ice ready whenever you need it. Hands-Free Autofill: This feature lets automatically fills any container with filtered water to the desired level without you having to watch. Precise Fill: Dispense filtered water in accurate amounts for trouble-free food and drink preparation. Door-In-Door: Innovative door design provides quick access to family favorites, from kids' snacks to re-corked wine bottles. Advanced Water Filtration: The MWF and RPWFE water filters remove 98% of 5 trace pharmaceuticals from water and ice. All you'll have is pure water and ice! Check out GE Café refrigerators on our website. Induction cooking works using an electromagnetic field and is entirely different from a traditional gas flame or electric coils. It requires the use of iron cookware to transfer energy to the pan or pot you are using. Precision guided cooking: There is no longer need to guess the right temperature or amount of time to cook the perfect meal. Hestan Cue®, an app-guided cooking system with temperature-sensing smart cookware automatically adjusts the pan temperature as you proceed through each video-guided recipe. Gourmet results without any guesswork: Who doesn't want to be a better chef? Boost your skills with Gourmet Guided Cooking. This technology combines video-guided recipes from professional chefs with a system that automatically adjusts the time, temperature, and pace to help you obtain ideal results. Use a smart device or voice and WiFi Connect to control your cooktop from any room in the house. Take a look at all GE Café induction cooktops on our website. With GE Café Ranges and GE Café Wall Ovens, your home can become your favorite restaurant--and you're the star chef. Cook meals to perfection and take out all the guesswork. Check out our website for ranges and wall ovens. Precision Cooking: Prepare the best meals of your life and get professional guidance. Featuring a Brilliant Touch 7-inch display, Precision Cooking modes, and WiFi Connect, you'll get expert advice on even the most challenging to prepare dishes. Brilliant Touch 7" Display: A bright, interactive touch screen makes it fun and easy to program. A touch of style can brighten your day and using the oven has never been... Well, cooler. Wi-fi Connected - Alexa: From any room in the house, you can now ask Alexa to check the remaining baking time. You can also use the Wi-Fi–connected range to change the oven's temperature, set it to preheat, send you a notification when the timer finishes, and more. Chef Connect: Put on your chef's hat. Chef Connect uses Bluetooth technology to pair compatible ranges, hoods, and over-the-range microwaves. When paired, the over-the-range microwave clock will sync to the range clock, so you only have to set or change one clock. Additionally, you can set the microwave surface light and vent fan to come on automatically when the range burners are in use. Range Hoods: Make sure everyone focuses only on your food with a 590-CFM venting system that eliminates smoke, grease, odors, and moisture from the air. Use the Café hood's convenient remote control to change fan speed and adjust brightness from across the kitchen, so you don't have to get up once you've sat down to eat. Check out our steam oven blog post for in-depth information about steam ovens. These quiet dishwashers feature hidden top controls and LCDs. An advanced wash system delivers with more than 140 cleaning jets, including Bottle Jets to wash tall and deep items, and silverware jets to remove stuck-on food. It is sure your dishes will be extra clean. Café built-in dishwashers offer adjustable racks to hold dishware of different sizes and a third rack for flatware and other utensils. Designed to be quiet, the Wi-Fi–connected dishwashers allow you to monitor cycle times, lock and unlock controls and determine if your rinse agent is low, directly from your smartphone. You can ask Google Assistant if the dishwasher has finished its load. Dishwasher Wi-Fi connect: You can monitor performance, check status and automatically reorder detergent directly from your mobile device. If you're comparing the different GE series, we shared an in-depth review of GE vs. GE Profile vs. GE Cafe Dishwashers. Check out all GE diswashers on Designer Appliances. GE Café Series of appliances brings out the best in style and technology in the kitchen. GE Café Series invokes inspiration and innovation for the home cook who loves to entertain. 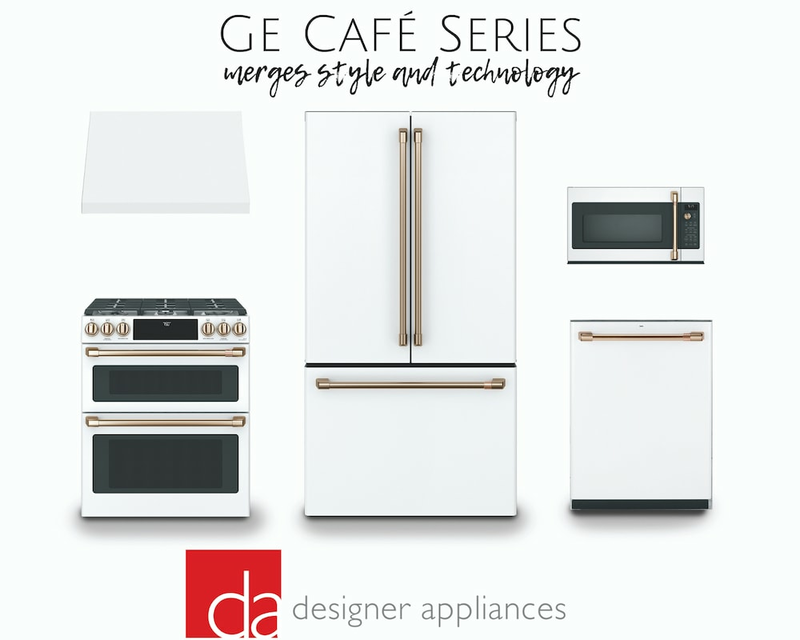 If you are interested in learning more about any of GE's Café Series appliances, please don’t hesitate to reach out to our team at Designer Appliances. If you are in the New Jersey area, be sure to stop by one of our New Jersey showrooms.